Epiphone A-212 Deluxe Model Arch Top Acoustic Guitar (1967), made in Kalamazoo, Michigan, serial # 892804, sunburst lacquer finish, curly maple back and sides, spruce top; laminated maple neck with rosewood fingerboard, original black hard shell case. 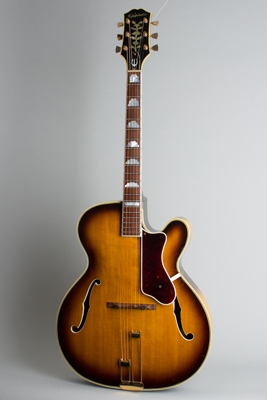 This is a very interesting and somewhat unusual archtop guitar -- a fully acoustic Epiphone A-212 Deluxe made in the second half of the 1960s. By this point production of such high end carved-top acoustic guitars was down to a trickle at Gibson, and Epiphone-branded examples are practically extinct. Only a handful of Deluxes and the even fancier Emperors were made each year, only offered in the cutaway format. Introduced in 1931, the Deluxe was the first top-of-the line mainstay for the original New York-based Epiphone company. Cutaway acoustic and electric Deluxe models appeared after WWII, but after Gibson bought the company and re-jiggered the line for 1959, the acoustic archtops were mostly overlooked in favor of electrics and flat-top guitars. The acoustic archtops were hardly promoted at all and few dealers likely even ever ordered one. The Kalamazoo-made Epiphone Deluxe is generally similar to the earlier New York models, though of course the finish and feel are purely Gibson. This is a full 17 3/8" wide carved-top guitar, still superbly elegant, though by this time made with a laminated maple back. The neck is the slimmer late-1960s Gibson style, though still made from a multiple lengthwise 5-way laminate like the originals. The spruce top is 7-ply bound and all surfaces are finished in a deep amber/brown sunburst. The triple-bound headstock still carries the original Epiphone "tree of life" inlay under the pearl logo, and the multi-bound rosewood fingerboard has the large cloud-shaped pearl inlay used on Deluxes since the 1930s. The serial number on this guitar dates the original shipment from Kalamazoo to 1967, but it likely sat in stock at the distributor for some time before going out for retail sale. In the case are the original unopened key envelope, hang tag, and a wholesale packing order from West Coast distributor L.D Heater to Harold's Music in Great Falls, Montana from July 1969. This document contains the individual shipping order for this guitar, the hard shell #1105 case, and a Model 1100 DeArmond pickup (which has since gone missing). The instrument was priced at $825, plus $85 for the case -- this was such an expensive package, the receipt notes it "could not ship via bus"! It looks like the original purchaser did not get a lot of use from the guitar, and now 50 years later is still not too far off from the condition it ventured out to Montana in! Overall length is 43 in. (109.2 cm. ), 17 3/8 in. (44.1 cm.) wide at lower bout, and 3 1/4 in. (8.3 cm.) in depth at side, taken at the end block. Scale length is 25 1/2 in. (648 mm.). Width of nut is 1 5/8 in. (41 mm.). This guitar remains all original and unaltered from new, showing just very little play wear. The finish shows some small scratches, dings, and dents, with a bit of wear to the top near the pickguard bracket. The original celluloid pickguard itself is in the beginning stages of outgassing, and has caused some "greening" and corrosion to the mounting bracket and screws. The gold-plated tailpiece shows some wear on the surface, but no repairs to the baseplate. The pearl inlay at the first fret is missing a small chip from the bottom edge, and the frets and fingerboard in the lower position have some light wear. The guitar plays very well and still resides in its clean original yellow-lined HSC. Excellent + Condition.